Have you properly acknowledged and cited other authors’ work in your manuscript? It can be hard to keep track, but failure to do so is viewed by journals as unethical and often leads to rejection. Using our Plagiarism Check Services is a great way to avoid accidental plagiarism. We use iThenticate software to help you identify passages in your manuscript that could be flagged by journals for accidental plagiarism. You will receive an iThenticate assessment and a report that will guide you in making it clear in your manuscript where you are building on the work of others. You can find more information about publishing ethics, including plagiarism, on our Author Services site. You send us your manuscript. You receive a report that recommends the appropriate corrective action for each issue. *We do not guarantee the detection of instances that are not highlighted by iThenticate. 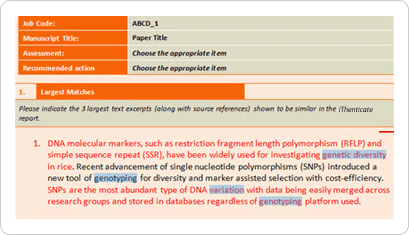 You'll receive a report indicating which sections of your manuscript might be flagged by journals for accidental plagiarism. In the Expert Recommendations section, our publication experts propose the best possible ways to revise relevant portions of your manuscript. What kind of comments can I expect from the expert? 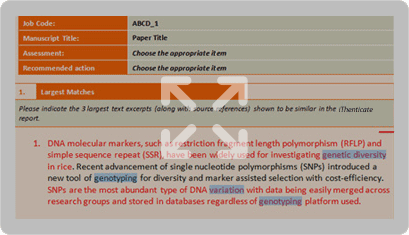 An expert will assess the iThenticate report, comment on the level of plagiarism and highlight the sections that absolutely require rephrasing to avoid a quality control desk rejection from any journal.